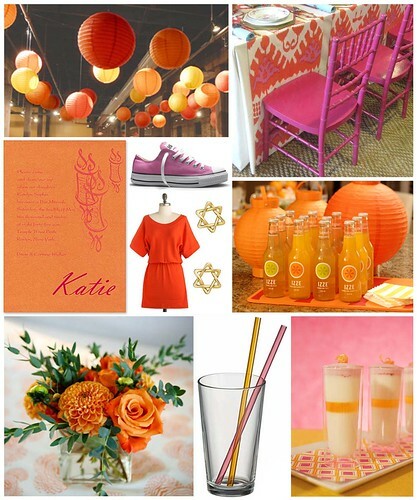 For a Bat Mitzvah party that is bold and bright, choose a color palette of orange and pink. The mix of colors is sure to bring serious style to your celebration. Dance and celebrate all night in comfortable style by choosing an orange tunic and pink sneakers. Accessorize with gold Star of David earrings -- Tunic by ModCloth, sneakers by Converse and earrings by Tiffany & Co.
FineStationery.com can personalize many Bar and Bat Mitzvah invitations with Hebrew. Contact one of our Specialists for more information on personalizing your invitation!